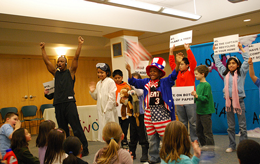 Kidworks Touring Theatre Company is a not-for-profit, 501(c)(3) Organization, dedicated to "Opening the doors between education and imagination...and bringing literature, geography, history and science to life!" 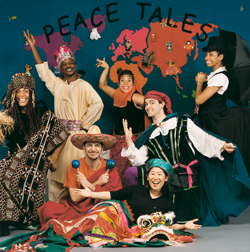 Since 1987, Kidworks has reached over one million children; traveling to schools, libraries, park districts, and museums, offering interactive touring productions, a variety of "hands-on" drama workshops and long term Artist-in-Residency programs for children pre-K through 12th grade. All of our programs promote multicultural tolerance, self-esteem, and a positive approach toward learning. We emphasize audience participation, encourage teacher involvement, and provide useful teacher study guides. Kidworks' goal is to reach out to as many children as possible from all socio-economic and cultural backgrounds, inspiring a lifelong love for learning while introducing students to other cultures through the arts. For over 32 years, Kidworks has been providing "hands-on" theater based experiences for children from poverty-stricken areas of Chicago, to children in rural areas who have limited access to the arts. Known for our innovation and ability to adapt our programs based on the curriculum needs of schools and libraries, Kidworks customizes its "hands-on" programs for each individual organization. Kidworks prides itself on meeting 27 out of 30 Illinois State goals for Learning and over 400 benchmarks Standards for PreK-12th graders, meeting school curriculum needs in the Fine Arts, Reading, Math, Science, Social Studies, Geography, History, Physical Education and Social/Emotional Learning. Children with physical, emotional and learning disabilities need individualized attention! Many of Kidworks' students are children challenged with A.D.D. / A.D.H.D, Cerebral Palsy, Autism, Learning Disabilities, Emotional and Behavioral Disorders, Physical and Developmental Disabilities, as well as Visual and Hearing Impairments. Our drama programs spark an extra boost to their self-confidence and provide a fun "hands-on" experience with instruments, costumes, and imagination. Kids that experience art through Kidworks learn to love learning!